Slope stability was carried out on the Tianziling landfill to investigate its safety at current and subsequent landfilling stages. The investigation was based on an understanding the high leachate generation rate and waste mechanics of the municipal solid wastes with a high content of kitchen wastes. The slope stability analyses indicate that the potential failure mode at the current state is a shallow slip induced by the high perched leachate mound. With the increase in the height of landfill, the failure mode will change from shallow slip to an overall slip along the bottom composite liner, which is lying on the sloping ground with an inclination of 1:4. The early warning levels for both the perched leachate mound and the main leachate mound in landfill were determined at different stages when the landfill is filled to different elevations. Engineering measures are proposed to enhance the slope stabilization as well as to increase landfill capacity. The measures include improving the configuration of liner system to be lined on the sloping ground, establishing three-dimensional drainage system to drawdown leachate level, raising the height of the downstream retaining dam, applying 10 m thick surcharge layer on the downstream slope, and setting up a safety monitoring system. Landfill stability analyses indicate that with these measures it is able to fill the landfill to the design height of 130 m, which will be the highest landfill in China. 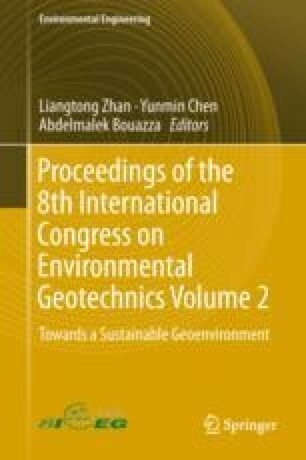 The authors acknowledge financial support from Major Science and Technology Projects of Zhejiang Province (No. 2015C03021) and National Science Fund for Distinguished Young Scholars (No. 51625805).